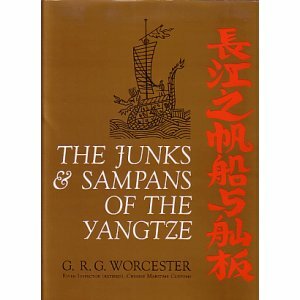 The amazing Junks & Sampans of the Yangtze by G.R.G. Worcester, River Inspector (Ret. ), Chinese Maritime Customs, offers fodder nearly unlimited for readers of this blog. Whenever I'm otherwise lacking for content, it's a convenient fallback. As I've been so busy lately with remunerative work (hooray!) that I've been unable to post for some weeks (alas! ), I'll take advantage of its easy pickings, with due gratitude to its masterful author. 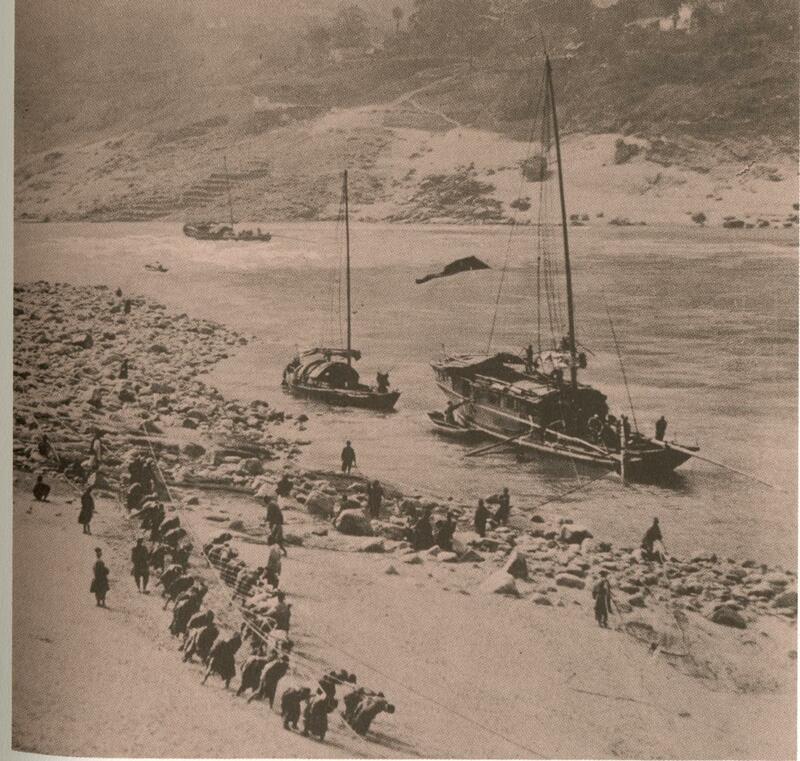 Well into the 20th century, there was much non-motorized traffic on the Yangtze. Vessels with sails used them when possible. But once inland, there are many impediments to sail, not least being the Yangtze's famous gorges, and its many rapids. As a result, sailboats and manually-powered vessels alike were often obliged to "track" or line themselves upstream, and sometimes downstream too. River vessels often carried large crews for the sole purpose of tracking. If it was inconvenient to land them directly from the mother ship, a small sampan like the one shown below was used. These were as short as 9 feet, with beam of 3.5 feet and depth of 1 foot, and featured a heavy rubbing strake that just kissed the lowest point of the shear. They were propelled by a yuloh, or sculling oar over the stern, built up of three sections to generate the desired angle between the handle-end and the shaft. 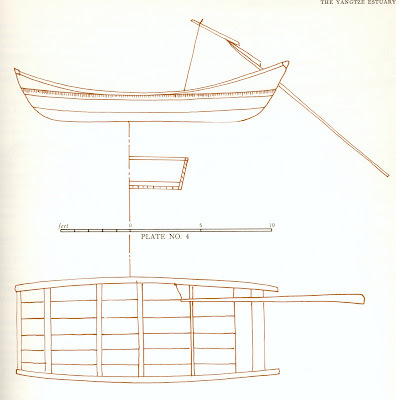 The line running from the upper end of the yuloh to the deck or gunwale was not simply to secure it to the boat: it was essential to the technique of "rowing", used in opposition to the "push" part of the stroke to provide the "pull" motion. The tracking line could be as long as 800 yards, and was always made of bamboo. This must have been a monster to handle. Trackers wore simple harnesses which spread fanwise from the main line. In addition to the men hauling the line, there were often one or two whose job it was to follow them, clearing the line from snags and lifting it over obstacles. 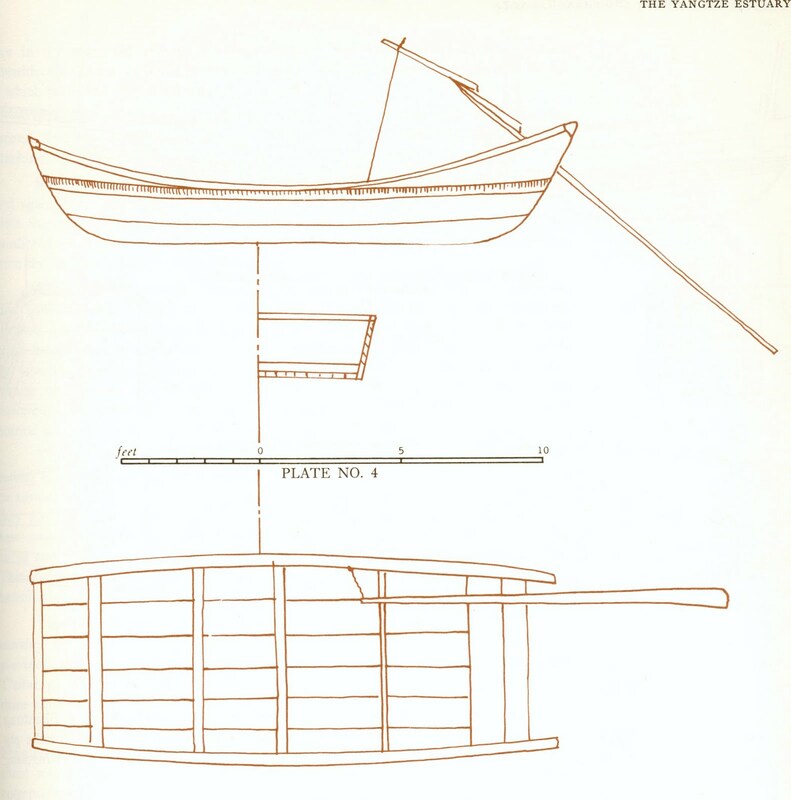 The sampan would also support the line between the shore and the vessel being hauled, my guess being that this reduced the water's drag on the line and helped maintain a more efficient, straighter run between the vessel and its motive power. In the picture below, the vessel being lined is the one in the far background to left of center, just beyond some white water. You can barely make out the tiny sampan supporting the line between it and the shore. Because the pull of the line was inevitably angled toward the shore, men aboard the vessel would use yulohs to steer the boat, playing their oars against the current to constantly maintain pressure toward the opposite bank. Many vessels had yulohs at both bow and stern. The junk nearest the viewer clearly shows a bow oar, and I believe you can detect one on the junk being lined as well. The two vessels in the middleground have evidently already been hauled past the rapids. Perhaps their men are resting after the effort, but it was not uncommon for a junk to be hauled all day, for days at a stretch, if conditions required. Riverside communities maintained towpaths, either voluntarily to promote their commerce, or by regulation. In some gorges, paths were entirely cut into the living face of the rock. Photos of these rock-face paths look precarious, and no doubt some individuals, and perhaps occasionally entire tracking crews, drowned due to a simple mistep, or to being overpowered by the current against the boat they were hauling. It's interesting to compare this all to the barge traffic of Olde England, where a barge's crew was typically limited to a small family, where the towing was invariably done by horse, and where locks, not manpower, served to overcome rapid changes in the river's elevation. In a comment on a recent post, reader Swarup Bhattacharyya drew my attention to his own blog on the boats of Bengal. Take a look. The variety of watercraft in the region Swarup covers is impressive. Lots of different construction methods and boat types. Thanks Swarup! Chesapeake Light Craft, one of the largest suppliers of boat kits for "stitch and glue" (a.k.a., taped seam, tack-and-tape, etc.) construction, has posted info. on a great new product. I only hope this will still be here after April 1. By the way, "einbaum" is German for dugout canoe, literally "one tree." Thanks to buddy Jean Paul Vellotti for this one.